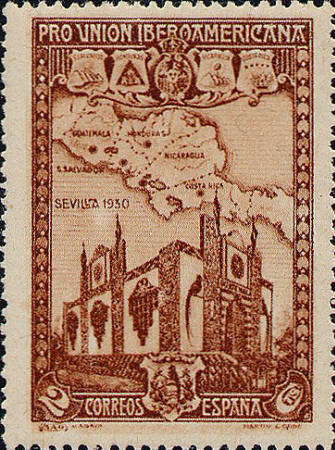 Spain issued a set of 16 stamps in 1930 to mark the Spanish-American Union Exhibition in Seville. On this stamp the large building is the Guatemalan pavilion at the exhibition, and the five miniature coats of arms along the upper and lower borders represent exhibitors. The country of El Salvador, on the west coast of Central America is mis-identified as San Salvador, the name of the capital city of the country.